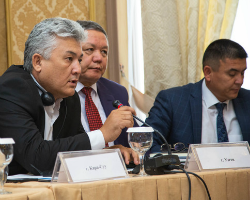 On 28 September 2018, Kyrgyzstan hosted its first National Healthy Cities Network meeting. This landmark occasion for the WHO European Healthy Cities Network marked the first time a National Healthy Cities Network has been established in central Asia. The event brought together more than 30 city mayors of republican, regional and local municipalities from across the country. City mayors, together with political representatives, line ministries and WHO technical experts on health and well-being examined the role of cities, municipalities and regions in achieving universal health coverage at the national level. International WHO technical experts delivered a presentation on how the National Healthy Cities Network can contribute to a healthier and happier future for Kyrgyzstan. Representatives of the Kyrgyz ministries of economy and health also gave presentations supporting the Healthy Cities approach. The presentations helped high-level officials and mayors in the country better understand Kyrgyzstan’s role in the WHO European Healthy Cities Network. They also offered an opportunity to discuss key concepts related to healthy cities and to inspire action by sharing country examples of innovative approaches that could be adapted to the Kyrgyz context to improve local health and well-being. Participants also engaged in an open discussion on reducing inequalities and improving the health of people, as well as milestones and potential opportunities in the country. “Putting health high on the political and social agenda of cities enables us to build a strong movement for public health at the local, national and regional level,” highlighted Dr Jarno Habicht, WHO Representative in Kyrgyzstan. “The seminar was valuable because it showcased that the WHO European Healthy Cities Network can play a pivotal role in addressing urban challenges and ensuring that we are moving toward universal health coverage by encouraging innovation and intersectoral action in our cities,” he said. The meeting concluded with a roundtable of mayors, who underscored the need to establish the National Healthy Cities Network and to boost cooperation in order to support cities in their response to change. Participants also looked to the future, focusing on close cooperation with ministries and state agencies. The meeting in Kyrgyzstan comes at an important moment: 2018 marks the 30th anniversary of the WHO European Healthy Cities Network. It served as a pre-conference event ahead of the 30-year celebration of the Healthy Cities movement on 1–4 October 2018 in Belfast, Northern Ireland (United Kingdom). The conference will focus on the 6 themes of the Copenhagen Consensus of Mayors, the new political vision for the WHO European Healthy Cities Network. Over 80 mayors and political leaders adopted the Consensus at the WHO European Healthy Cities Network Summit of Mayors in Copenhagen, Denmark, in February 2018. The mayor of Jalal-Abad, Kyrgyzstan, represented the city at the Summit. Kyrgyzstan is rapidly urbanizing and is prioritizing urban and regional development in key national policy documents. Currently, 2 cities have been identified as being of importance at the national level, 12 at the regional level and 17 at the district level. A number of challenges to address and opportunities to leverage to improve health and well-being in cities and municipalities across the country have also been identified. Kyrgyzstan is one of the few countries in central Asia to utilize a network of this nature to make the best use of the Healthy Cities approach in the country. The meeting was supported by technical and financial assistance from WHO in accordance with the biennial collaborative agreement for 2018–2019 between the Ministry of Health of Kyrgyzstan and WHO.